"The Department of Commerce is not able to determine definitively how inclusion of a citizenship question on the decennial census will impact responsiveness. However, even if there is some impact on responses, the value of more complete and accurate data derived from surveying the entire population outweighs such concerns. Completing and returning decennial census questionnaires is required by Federal law, those responses are protected by law, and inclusion of a citizenship question on the 2020 decennial census will provide more complete information for those who respond." Starting in 1970, questions about citizenship were included in the long-form questionnaire but not the short form. 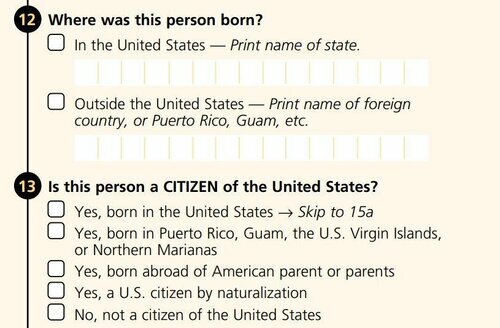 The 2000 census short form asked about race but not citizenship, which the long form did those who received the long form were asked, "Is this person a CITIZEN of the United States?" Bill Clinton was President and there wasn’t a HUE and Cry then. The 2000 long-form survey, sent to a subset of Americans, asked about citizenship. The more widely distributed census short form that year did not. The 2000 census short form asked about race but not citizenship, which the long form that year did ask about. In 2005, the census added a new survey, the American Community Survey, conducted every year and sent to 3.5 million households. It asks many of the same questions as the census long-form surveys from 1970 to 2000, including the citizenship question. In 2010 the citizenship question was removed. The Census it had been replaced by the annual American Community Survey. The decennial census form asked just 10 questions.